Welcome to Season 2, Episode 18 of Scary Stories Told in the Dark, starring Otis Jiry. 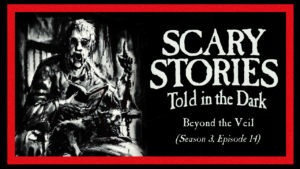 In this episode of Scary Stories Told in the Dark, we bring you four terrifying tales from authors Brandon Wills, Keith Daniels, Danielle Hamilton, and CuriousInsect, performed by host and narrator Otis Jiry, about cryptid encounters, heightened horrors, ominous omens, and inhuman entities. Love all the team at CTFDN network for producing superb content and the best spine tingling tales to guarantee sleepless nights.Keep up the great work! But it would be great to see a second season of Horror Hill.I really miss it!